New Rochelle, NY, September 13, 2017–New research has shown that the success of transplanting stem cells into the brain to regenerate tissue damaged by stroke may depend on the maturity of the neuronal precursor cells used for transplantation. A study demonstrating the significant impact of human neuronal precursor cell maturity on cell survival after transplantation into stroke-injured rate brains is published in Tissue Engineering, Part A, (http://online.liebertpub.com/tea) peer-reviewed journal from Mary Ann Liebert, Inc., publishers. The article is available free on the Tissue Engineering website until October 13, 2017. Coauthors Samantha Payne, Priya Anandakumaran, Cindi Morshead, and Molly Shoichet, University of Toronto and Balazs Varga and Andras Nagy, Mount Sinai Hospital, Toronto, Canada, evaluated the survival of three subpopulations of human induced pluripotent stem cell (iPC)-derived neuronal precursor cells: early-, mid-, and late-differentiated cells. Significantly more early- and mid-differentiated neuronal stem cells were present in the rat brains one week after transplantation compared to late-differentiated cells. Furthermore, the mid-differentiated cells were the most likely to mature and become neurons, according to the results reported in the article entitled "In Vitro Maturation of Human iPSC-Derived Neuroepithelial Cells Influences Transplant Survival in the Stroke-Injured Rat Brain." "Temporality as a variable in tissue engineering has rarely been explored. This is an excellent addition to our understanding of cell behavior in a therapeutic circumstance," says Tissue Engineering Co-Editor-in-Chief Peter C. Johnson, MD, Principal, MedSurgPI, LLC and President and CEO, Scintellix, LLC, Raleigh, NC. Tissue Engineering is an authoritative peer-reviewed journal published monthly online and in print in three parts: Part A, the flagship journal published 24 times per year; Part B: Reviews, published bimonthly, and Part C: Methods, published 12 times per year. Led by Co-Editors-In-Chief Antonios G. Mikos, PhD, Louis Calder Professor at Rice University, Houston, TX, and Peter C. Johnson, MD, Principal, MedSurgPI, LLC and President and CEO, Scintellix, LLC, Raleigh, NC, the Journal brings together scientific and medical experts in the fields of biomedical engineering, material science, molecular and cellular biology, and genetic engineering. Leadership of Tissue Engineering Part B (Reviews) and Part C (Methods) is provided by John P. Fisher, PhD, University of Maryland and John A. Jansen, DDS, PhD, Radboud University, respectively. 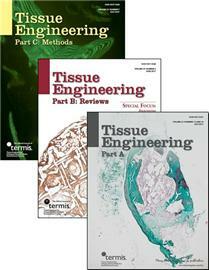 Complete tables of content and a sample issue may be viewed online at the Tissue Engineering website. Tissue Engineering is the official journal of the Tissue Engineering & Regenerative Medicine International Society (TERMIS).